Falvey Memorial Library :: Feedback Friday: How green will you be? Feedback Friday: How green will you be? 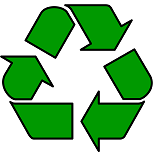 The Earth Day motto is “Recycle, Reuse, or Reduce.” At the library, recycling bins abound, recyclable products are purchased, and packaging materials are reused. We have DVD titles such as China Blue and Thirst and book titles such as Brewing Justice and Organic, Inc . What are you doing to make the world a “greener” place? Lots of great reusable stuff! Would it be possible to put plastic recycling containers on every floor of the library (and in multiple locations? As a frequenter of the 3rd floor, I get frustrated everyday watching student after student chuck plastic & glass bottles into the closest trash can. It seems like have a clearly marked recycling container next to the trash cans by the study tables would be a smart move! Also, very frequently by the end of the day the recycling containers in the coffee lounge are full-to-overflowing and deter people from using them.